Great location, charming staff, spotlessly clean , very quiet. Would highly recommend. This trullo has been beautifully reconstructed to a high standard. We had a very restful week here and used it as a base to explore southern Puglia. The lovely owners, Ed and Gemma, live in close proximity and so are on-hand for any advice and recommendations. We stayed in February and although we had a week of sun it was too cold to use the infinity pool which, we imagine, would be fantastic in the heat! The design of the trullo means you aren’t overlooked in any way and it’s remote location ensures a peaceful stay. Where to find Ostuni hotels near an airport? 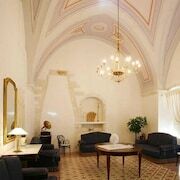 How can I find hotels in different Ostuni neighborhoods? Where can I find hotels in Ostuni that are near tourist attractions? When planning your Salento Peninsula escape, you can rest assured because you'll find a diverse selection of first-rate stay options in Ostuni. Expedia's booking page currently contains 35 places to base yourself within a 0.1-kilometre (0.06-mile) distance of downtown Ostuni. Within 1 kilometre (0.6 miles) of downtown Ostuni, visitors can find some great hotels, like the Relais La Sommità and Ostuni Palace Hotel Meeting SPA. Ostuni offers a number of lower-priced hotel and apartment options sure to please thrifty travelers. The Città Bianca Country Resort is 4 kilometres (3 miles) from the center of Ostuni, while the Monte Sarago is 0.7 kilometres (0.4 miles) away. 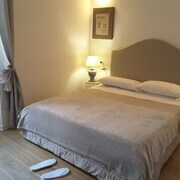 The Masseria Palombara Grande and the Hotel Masseria L'Ovile are two other economical accommodations worth looking into. The Borgo Egnazia can be found 20 kilometres (14 miles) away from the middle of Ostuni. 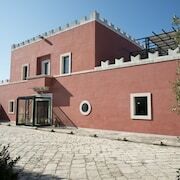 Another option is the Masseria Torre Maizza, which is positioned 20 kilometres (13 miles) away. 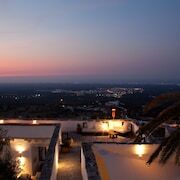 Two more alternatives in this area are the Masseria Fumarola - Guest House and the Hotel Del Levante. Brindisi is 35 kilometres (20 miles) to the east of Ostuni and is home to the Museo Archeologico Provinciale Francesco Ribezzo and Monument to Italian Sailors. 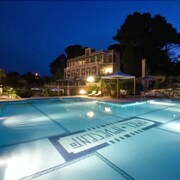 If you'd like to visit Brindisi, check out the Santo Stefano Luxury Rooms and Palazzo Virgilio. 65 kilometres (40 miles) to the southeast of Ostuni, you may also choose to stay at Copertino, home to the Agriturismo Mele and Villa Casole Short Lets. If you're staying in Copertino, a couple of sights worth adding to your itinerary are the Copertino Castle and Sanctuary of Santa Maria della Grottella. If sport is what you love, make sure you visit Stadio San Nicola, which is 75 kilometres (46 miles) to the northwest of Ostuni. For tourists who are interested in booking a room nearby, make a reservation in the Grande Albergo delle Nazioni or Oriente Hotel. Papola Casale Airport is 30 kilometres (20 miles) away from Ostuni. Should you choose to stay nearby, you can easily book a night at the Grande Albergo Internazionale or the Hotel Nettuno. What are the most popular Ostuni hotels? Are there hotels in other cities near Ostuni? 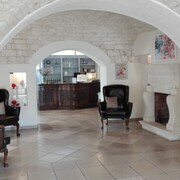 What other types of accommodations are available in Ostuni? 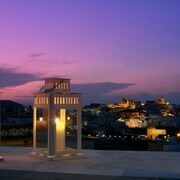 Explore Ostuni with Expedia.ca’s Travel Guides to find the best flights, cars, holiday packages and more!